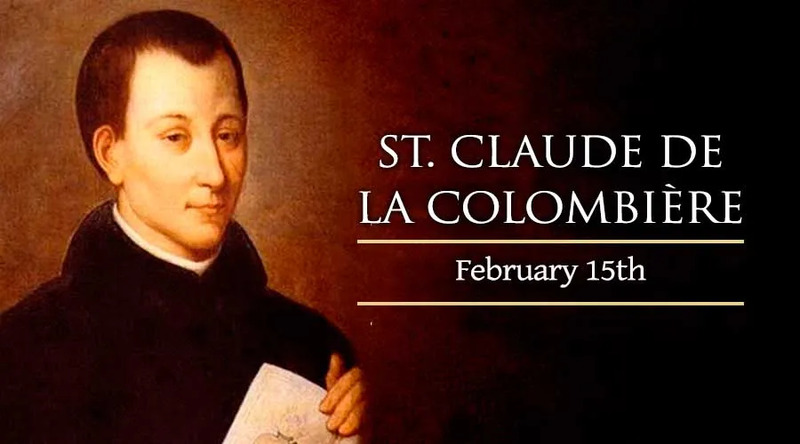 On Feb. 15 the Catholic Church honors Saint Claude la Colombiere, the 17th century French Jesuit who authenticated and wrote about Saint Margaret Mary Alacoque's visions of the Sacred Heart of Jesus. Born in the south of France during 1641, Claude la Colombiere belonged to a family of seven children, four of whom entered the priesthood or religious life. He attended a Jesuit school in his youth, and entered the order himself at age 17. As a young Jesuit recruit, Claude admitted to having a “horrible aversion” to the rigorous training required by the order in his day. But the novitiate of the Society of Jesus focused and sharpened his natural talents, and he would later take a private vow to obey the order's rules as perfectly as possible. After completing his order's traditional periods of study and teaching, Claude became a priest in 1669. Known as a gifted preacher, he also taught at the college level and served as a tutor to the children of King Louis XIV's minister of finance. In 1674, the priest became the superior of a Jesuit house in the town of Paray-le-Monial. It was during this time, in his role as confessor to a convent of Visitationist nuns, that Claude la Colombiere became involved in events that would change his own life and the history of the Western Church. One of the nuns, later canonized as St. Margaret Mary Alacoque, claimed to have experienced private revelations from Christ urging devotion to his heart as the symbol and seat of God's love for mankind. Within the convent, however, these reports met with dismissal and contempt. During his time in Paray-le-Monial, Father la Colombiere became the nun's spiritual director, giving careful consideration to her testimony about the purported revelations. He concluded that Sister Margaret Mary had indeed encountered Jesus in an extraordinary way. Claude la Colombiere's writings, and his testimony to the reality of St. Margaret Mary's experiences, helped to establish the Sacred Heart as a feature of Western Catholic devotion. This, in turn, helped to combat the heresy of Jansenism, which claimed that God did not desire the salvation of some people. In the fall of 1676, Father la Colombiere, was called away from Paray-le-Monial to England. During a time of tension in the religiously torn country, he ministered as chaplain and preacher to Mary of Modena, a Catholic who had become the Duchess of York. In 1678, a false rumor spread about an alleged Catholic “plot” against the English monarchy. The lie led to the execution of 35 innocent people, including eight Jesuits. La Colombiere was not put to death, but was accused, arrested, and locked in a dungeon for several weeks. The French Jesuit held up heroically during the ordeal, but conditions in the prison ruined his health before his expulsion from England. He went back to France in 1679 and resumed his work as a teacher and priest, encouraging love for Christ's Sacred Heart among the faithful. In 1681, Claude la Colombiere returned to Paray-le-Monial, the site of St. Margaret Mary Alacoque's revelations. It was there, during 1682, that the 41-year-old priest died from internal bleeding on the year's first Sunday of Lent, Feb. 15. St. Claude la Colombiere was beatified in 1929 – nine years after the canonization of St. Margaret Mary Alacoque – and canonized 63 years later.